If you spend too much time in your daily SEO reporting activities, pulling, integrating and sharing your SEO traffic data from Google Analytics and link related metrics from tools such as Open Site Explorer you have arrived to the right place! 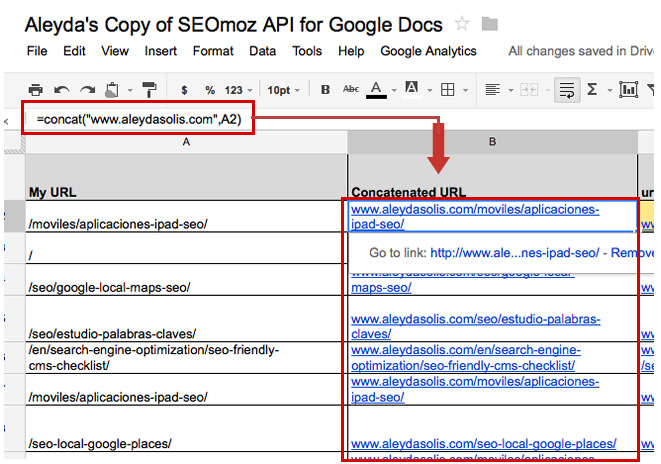 The Solution: An SEO Traffic & Link Popularity Dashboard in Google Docs. 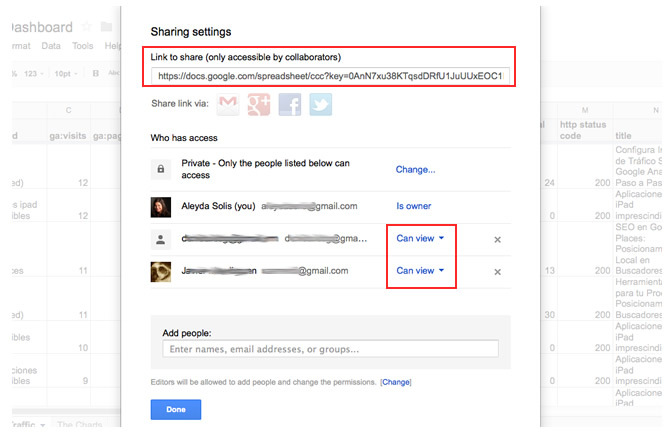 To import Google Analytics data to Google Spreadsheets we’re going to use the Google Analytics integration with Apps Script released last August that allows us to pull and display the data in Google Docs. If you want to add or modify any metrics or dimensions you can use this Google Analytics dimensions and metrics reference and test with the Google Analytics Query Explorer. The key: The characters in the “key=nnnnn#gid” area. We’re going to use this later to import the data of the sheet from another one to be used for the dashboard. 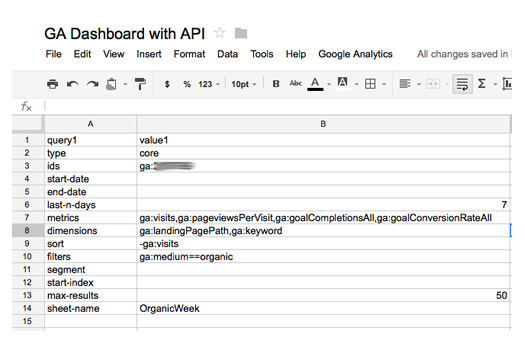 The data: The organic traffic related data we’re going to use for the dashboard. I have selected an unfiltered profile to show how you can do in the case you don’t have a filter to show the full URL of the pages (which is recommended although unfotunately not that common). Also, in this case we see many “(not provided)” as top keywords, so if you don’t want to include these you may want to apply a segment for organic traffic without “(not provided)”. 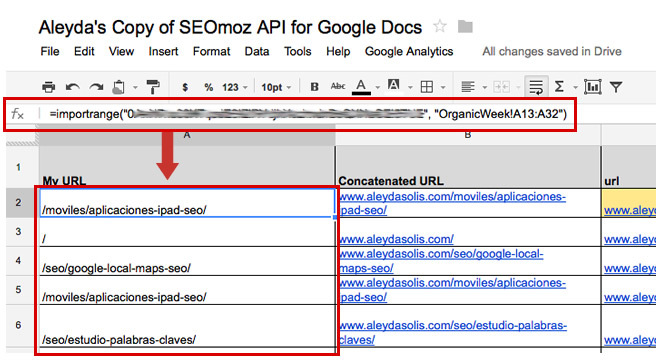 To get Open Site Explorer’s link related metrics we’re going to use the SEOmoz data for Google Docs tool from Chris Le. Chris explained in this SEOmoz post how the script works and he shared an easy to configure template so we could copy and use it, thank you Chris! Or simply by creating a graphic visualization of the data! 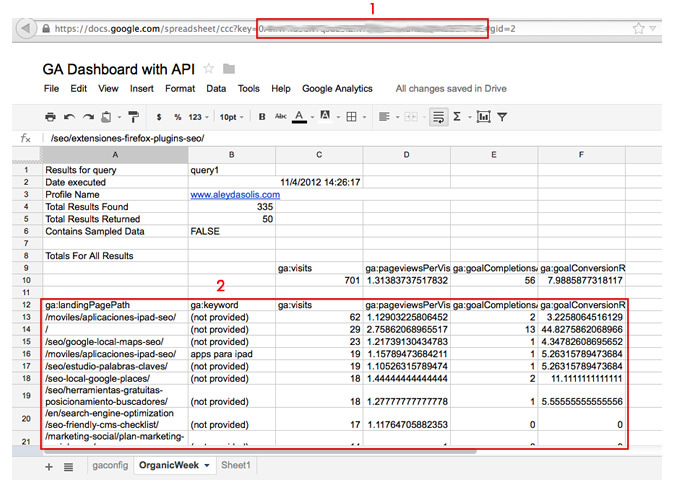 With this example I hope you’ve gotten more ideas and see the possibility to build your own SEO Dashboard by using Google Docs, automatizing some of the more time consuming SEO tasks. Photos under Creative Commons taken from Flickr: Photo 1 & Photo 2.